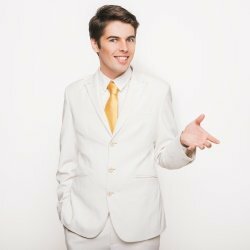 Following on from his sensational runs in London and the Edinburgh Fringe, Quentin Dentin, the star of his very own musical show The Quentin Dentin Show, has stepped off the stage and has released his long-awaited debut album. The album has music and lyrics by Henry Carpenter and is produced by Paul Garred, co-founder and original drummer of The Kooks. I’m not sure really how to go about reviewing this album. It definitely wasn’t what I expected from someone whose songs have been described as the future of musical theatre’ and ‘the best new score that British musical theatre has produced in years’. Quentin has not produced a regular musical theatre album in any way. The opening, “Radio Interruption”, actually had me checking my PC to ensure that I hadn’t accidentally turned on the radio instead of the album. It was very slick and quite believable, very reminiscent of the good old days when you would sit moving the tuner up and down trying to find a particular station. I think it was when I hit the comment about an ugly brain, I really realised this album was going to be fun, and the beach body segment at the end of the track really did make me smile. The more I listened to the album, the more I appreciated it. This really is an album you should have on repeat play to get the full effect. Its difficult to say exactly what style the various tracks are in as there is quite an eclectic mix, sometimes actually within a song – such as “Lemons” which starts with a spoken question then moves on to a happy sounding singalong containing some rather unusual advice. There is a definites skill in the writing of this album. Let’s be honest, anyone that can make a tune out of a dry subject like numbers is on to a winner – in fact, if I was a Maths teacher I would play the track “Numbers” at the start of every class to get the students in the mood. By the end, I was still unsure about what I had just lived through. The Quentin Dentin Show is many things, but it is not just a musical theatre album. There are fifteen very individual tracks – my favourite has to be “Get Happy” which really raised a smile – and each one comes together to form a pretty impressive whole. By the end, I realised I had enjoyed it so much I had to play it again. There may not be any real jazz hands numbers, and not every number worked for me personally, but The Quentin Dentin Show is an intriguing album that will draw you back to listen to it again and again.